Perhaps you just packed up all your things and moved out of a dorm room, house, or apartment and into a new place (or returned to your family’s home for the summer). Did you have a lot of things? As someone who moved six times (in 5 states) between the years 2007 and 2013, I often think about the amount of stuff that I accumulate over time. This week’s new book is all about how many peoples around the world developed consumer cultures since the fifteenth century. 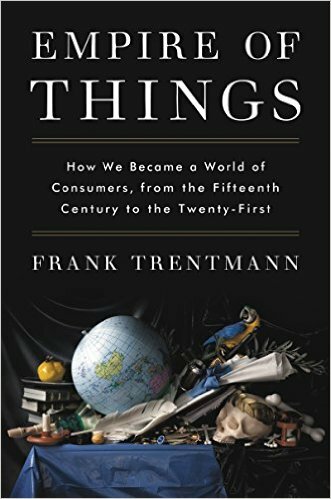 Although consumerism is often thought of as uniquely American, Trentmann shows how various societies developed a taste for new consumer goods such as coffee, tea, tobacco, and cotton. He argues that the rise of a trade in consumer goods was inextricably bound up with conquest and the rise of empires and he demonstrates the repercussions of the global consumer economy. This book brings together narratives from all over the world, not just Europe and America, and ends with a meditation on waste and excess. This entry was posted in new stuff tuesdays and tagged business, colonialism, consumer culture, consumerism, consumers, economics, empire, foreign trade, history, new stuff, sustainability, trade. Bookmark the permalink.